Anterior Cruciate Ligament (ACL) injuries are quite common and affect approximately 250 000 people per year. Athletes playing sports involving jumping, pivoting, and hard cutting such as basketball, soccer, and football are at the highest risk. Athletes who suffer from these injuries and have a subsequent surgery have muscle weakness, reduced joint ranges of motion, reduced sports performance, an increased risk of re-injury and long term knee injury including osteoarthritis. This outline of re-injury prevention strategies and rehabilitation guidelines is not a comprehensive list of steps that should be followed strictly but rather a set of ideas supported by the relevant research. All ACL rehabilitation programs should be directed and monitored carefully by a trained healthcare professional like a Chiropractor or Physiotherapist. According to a recent study by Grindem et al (2016) in which 106 patients involved in cutting and pivoting sports were analyzed, return to sport prior to 5 months led to 100% chance of re-injury and for every month that return to sport was delayed, until 9 months after ACL reconstruction, the rate of knee re-injury was reduced by 51%. With that same group of athletes, more symmetrical quadriceps strength prior to return to sport significantly reduced the knee re-injury rate. In the first 2 years after ACL reconstruction, 30% of the people studied who returned to jumping, pivoting, and cutting sports sustained a re-injury as compared with 8% of those who participated in lower level sports. The study group advised that return to these “high-risk” sports should be delayed to at least 9 months following surgery. 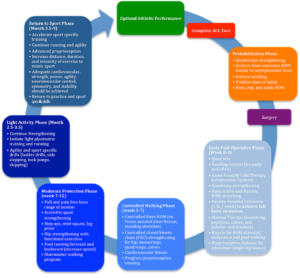 While the timeframe for return to sport and the sport of choice are factors that can be controlled easily, the rehabilitation plan focusing on functional improvement can be optimized for improved outcomes. Here are general guidelines for gradual return to sport. Prior to surgery, work with your healthcare practitioner to maximize knee extension range of motion and strengthen your quads. Keep a positive state of mind! For the first few weeks after surgery, use cold and compression to reduce knee swelling. Consider the Game Ready(R) Cold Therapy Compression Systems for this phase. At the same time, work to regain your knee extension and quad strength. After consulting with your Orthopaedic Surgeon, you may start manual therapy, pool walking, and low resistance stationary cycling. You may now begin to stretch and strengthen your hips, hamstrings, quadriceps, and calf muscles with load bearing light strength training. Start to include balance work with your healthcare provider and improve your cardiovascular fitness on the bicycle. You should now be doing full body strength training like step ups, mini squats, and leg press in a slow and controlled manner. Increase your speed and directional changes in the pool and consider a stair-master or elliptical machine for cardiovascular variety. Continue full body strength training while adding in light plyometric, agility, and running drills to begin to lightly mimic sport. Progress to advanced balance, agility, strength, power, and cardiovascular exercises with the goal of movement quality and symmetry. Sport specific training involving movement redirection and jumping in a controlled manner. Return to individual practice can occur in the second half of this phase if Return to Sport Criteria (see below) are met. You should have complete and pain free hip, knee, and ankle range of motion. Your quality of gait, jumping, running, and cutting should be demonstrated with no compensation or apprehension. The laxity of your knee should be tested with a KT 2000 test by the Orthopaedic Surgeon. Your strength should be assessed at various knee angles using objective measures like isokinetic testing using a Biodex Dynamometer. Balance training should have advanced to include sport specific multi-directional and multi-force perturbations that mimic the unpredictable nature of your sport. Gradual return to play should involve a number of weeks in non-contact practice, followed by a number of weeks of gradual playing time within contact practice, followed by gradual playing time within games. The goal of the return to sport process is to gradually load your knee within your sport, while at the same time allowing for adequate recovery and monitoring of progress. It is advised to err on the side of caution and use longer timeframes for return to game play! Grindem, H., Lynn Snyder-Mackler, Moksnes, H., Engebretsen, L., Risberg, M.A. (2016). Simple decision rules can reduce reinjury risk by 84% after ACL reconstruction: the Delaware-Oslo ACL cohort study. British Journal of Sports Medicine, 50: 13, 804-808.